Anybody else out there on a balanced calendar? My district just went to a balanced calendar this year. We started way back at the beginning of August (first student day was the 6th!). We have two weeks off in October, two weeks at Christmas, & then two for Spring Break (except that we will make up any snow days that second week). So far, I'm really liking the schedule! This week, I've been teaching a group of fifteen kiddos during our Fall Enrichment Camp (which is just lasts the first week of break). Next week, I'm heading to Colorado to visit my brother & his family--but that's a different post. The theme of the week was SPACE. We had a really fun week! I pulled activities from Abby's Amazing Astronaut Activities pack & from Holly's Space Activities pack. I also pulled lesson plans from NASA. Did you know that astronauts have studied how toys behave in space? NASA even has lesson plans & videos available online for teachers to use! This week, we were investigators too! We used the toys here on Earth, recorded our observations, then we viewed the NASA video clip to make observations about how the toy behaved in space. We investigated yo-yos, boomerangs, marbles, and climbing bears. Luckily, included in the NASA plans are masters & directions for your kiddos to make their own paper boomerang & climbing bear. We had SO much fun! 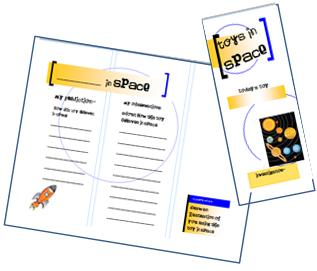 I made a little Toys in Space brochure for my kiddos to record their observations. On the outside, there's a place for kiddos to record their observations about how the toy behaves on earth. On the inside, they record a prediction about what the toy will do in space. After viewing the NASA video, they record their observations & draw an illustration. Please feel free to grab this freebie to use along with the info from NASA. We also did Voki planet reports! After researching a planet, kiddos created a voki & typed in the report so that the voki character reads it. They had SO much fun! Here's one of the kids' vokis for you to check out. If you'd like to do this with your kiddos, you can grab a copy of the research & publishing guide here. Thanks! Love your blog! I'm your newest follower and linked up!